I don't know when it started, but at some point it became a tradition for me to make a cheesecake for Thanksgiving. And surprisingly enough I do not cater to the seasonal dessert flavors with this cheesecake. 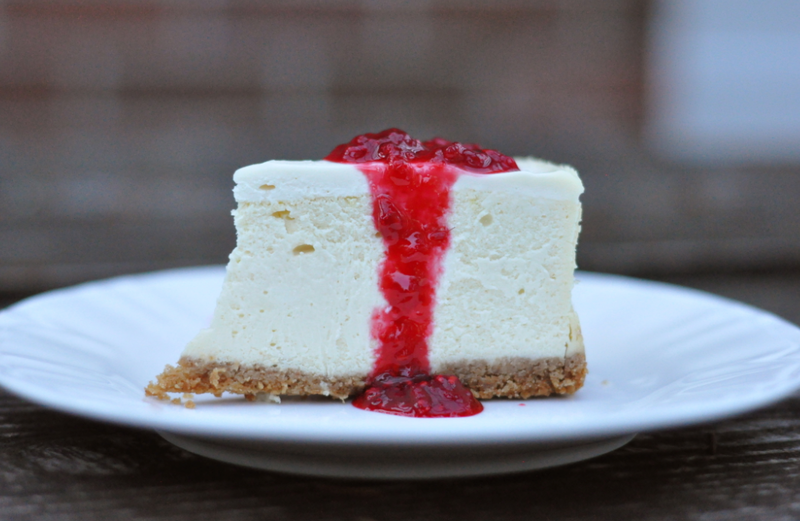 No pumpkin or cranberry twist, just plain and simple New York cheesecake. I get the recipe here and it has never failed me. Of course I cut the sugar in both the cheese portion and I do not put sugar with the graham cracker crust, that just seems ludicrous and nauseating to me. I guess my signature is cutting sugar, how cool of me. Moving on. I think everyone who has any interest in baking should make a cheesecake. It's one of those things that seems exceedingly more complicated than it actually is. I for one can say, before ever making a cheesecake, I would order them at cafes and think, "this is one heck of a dessert, I would never imagine making one!" Yup, I have thought that. And then one day, as I usually do, I decided I was going to venture into the world of that dessert. Of course, I then discovered that all those cheesecake makers were not super heros, but mere mortals and I was joining them in their cool cheesecake club. But not to discredit them (or myself) because it does take a certain amount of talent to master this cake. After all, how do I manage, so many years in a row, to get it right? Ya, I'm bragging. Oh well. So try it. Make yourself a cheesecake (but don't eat it all by yourself, that would just be gross). I say start with the basic and move on to those other fancy cheesecakes. Baby steps friends, baby steps.